MainAll NewsMiddle EastJust How Many Arabs Are in Israel? Just How Many Arabs Are in Israel? PA's stats bureau releases official figures: there are 4.68 million Arabs in Gaza-Judea-Samaria, and that's set to grow with 40% under 14. The Palestinian Authority's (PA) Central Palestinian Bureau of Statistics on Thursday released its official figures on the number of Arab residents of Judea, Samaria and Gaza. According to the stats, there are a full 4.68 million Arabs in the three areas combined; of that number, 2.68 million live in Judea and Samaria - apparently including the more than 230,000 living in eastern Jerusalem given the high number - and 1.82 million live in Gaza. The Palestinian Arab population is very young, with no less than 39.4% under the age of 14, indicating that the population is only growing. However, the average number of people per family declined to 5.2 in 2014 as compared to 6.4 in 1997. The percentage of unemployed people in the first quarter of 2015 reached 25.6%, although there was a distinct difference between Judea and Samaria where unemployment was 16.3% as compared to the Hamas-run Gaza, where it stood at 41.6%. Hamas has been blamed with neglecting its population, while Jewish employers in Judea and Samaria have provided many jobs for Arabs. Despite the high unemployment, a vast majority of 80.3% of the Palestinian Arabs in 2013 owned housing units, with the percentage of renters standing at a mere 8.3%. In contrast to claims sometimes aired - most famously by EU Parliament President Martin Shultz in February 2014 - that Palestinian Arabs do not have enough water or resources, the PA's figures show that nearly all Arabs receive the resources they need. A full 96.4% live in residential units which receive water from the authorities, and nearly all families are connected to electricity. Those not receiving water or electricity likely include the illegal housing units and shacks, of which many can be seen lining the highway from Jerusalem going east towards the Dead Sea. The demographic issue has been a key concern in drafting Israeli policy regarding Judea, Samaria and to a lesser extent Gaza. 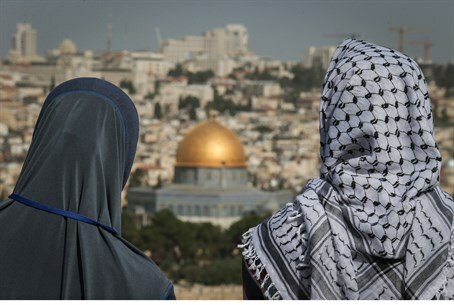 Leftists have argued for the creation of a Palestinian state in the region to avoid incorporating the Arab residents as citizens and upsetting Israel's demographic balance and Jewish nature - even while seeking to retain Israel's more than 1.5 million Arab citizens. Meanwhile those on the right have been divided, with some calling to annex the region and grant citizenship to the Arabs who want it, thereby taking the risk of creating a potential demographic time bomb, while others have pressed to annex and expel the Arab population, thereby completing the population transfer that began when the Arab world forcefully expelled 850,000 Jews following the establishment of the modern state of Israel.